While commuting to work in Washington, D.C., will always be a challenge, few modes of transportation leave the commuter with this feeling: invigoration. In fact, that's how Shaun Abell, Horticulturist with the U.S. Botanic Garden, describes his daily commute by bike every morning. And he's in good company. Quite a few Architect of the Capitol employees commute by bike, forming a group that meets monthly to work on promoting cycling to fellow AOC employees. Their discussion topics include how to break down barriers to bike commuting, finding ways to educate and train those interested in biking to work, and encouraging safe practices—all with limited resources. The group, which has been active since the National Bicycling Summit in March, is incredibly passionate about biking and bike safety. Their mission is to spread the word that biking can be many things: fun, energizing, economical and above all—safe. 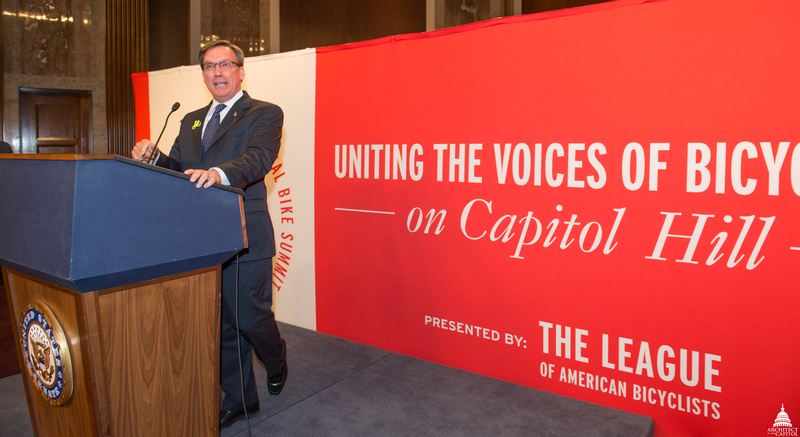 Architect of the Capitol Stephen Ayers addressed the League of American Bicyclists at the 2014 National Bike Summit. Jamie Herr, Sustainability Program Specialist with the Sustainability, Energy and Water Conservation Division in Planning and Project Management, is the leader of the AOC Bike Group. "We're a dedicated group of individuals from many different jurisdictions, all working to address some of the roadblocks and challenges AOC employees and visitors may encounter when biking to Capitol Hill," she said. "We're focused on meeting the goal set by Mr. Ayers to become a League of American Bicyclists' Bike Friendly Business." Q: Why do you commute to work by bike? "It's fun, and riding through the U.S. Capitol Grounds is both beautiful and inspiring." "It is a refreshing way to wake up in the morning, it is faster than commuting by Metro and a more convenient way to get around the city." "It does several things simultaneously. It is a fun way to get to work, a great form of exercise, and it does not pollute the environment. When I get to work, I feel energized and in a great frame of mind because of the experience." "Biking takes the same amount of time as driving, but I get the added benefit of parking close to the building where I work. It's also a great stress reducer and fun." "It's great for my physical and mental health—I enjoy active transportation." Q: What are some of the challenges of biking to work? MJP: Any kind of precipitation: rain, snow and ice. MG: When it is very hot and humid outside, I need to take a shower when I get to work and that increases the time it takes me to commute. MS: Sharing the road with cars and pedestrians can often be challenging, especially during rush hour. Both drivers, pedestrians and sometimes other bikers can be unpredictable, so I always need to stay alert to avoid having an accident. JK: One of my challenges is biking up a big hill on my way home. EG: Traffic and distracted drivers. Too many drivers are focused on their electronic devices or just getting to where they want to go as fast as they can. They don't see bicyclists unless you get their attention. Q: What are some of the positives of commuting by bike? MJP: It's the quickest way for me to travel around Capitol Hill if I need to run an errand on my way home. MG: It's like a morning coffee. It's empowering to know that I can physically power myself pollution-free to work. It also makes me physically active and happy. MS: I enjoy seeing and exploring parts of D.C. that I would not typically see when driving. And if I want to stop somewhere, being on a bike offers more flexibility than driving because finding parking for cars is usually more difficult than finding a place to lock a bike. JK: It's a great low-impact exercise that's also fun. EG: I enjoy all I get to see along my trip. I go by the Potomac River, the Memorial Bridge, Lincoln Memorial, World War II Memorial, Washington Monument and many others. Q: What's some advice you'd share with other employees just starting to commute by bike? MJP: Always wear a helmet and drive defensively— assume that cars cannot see you. Get a good rack or baskets to carry things easily. MG: Smile and be friendly and courteous to drivers. Take a class to learn the rules of the road—it will help you ride confidently. MS: It takes a bit of time to build up your strength and stamina. If you live far away from work, for the first few weeks you may want to break up the commute into shorter distances. For example, you can bike to a Metro or bus stop and take public transportation the rest of the way. JK: Take the time to plan a safe route that uses paths and bike lanes. EG: New riders may want to try using Capital Bikeshare if they do not already have a bike. It may be a good alternative on a day when wet weather is expected. For more information about the AOC Bike Group and how you can become involved, email biking@aoc.gov.